A computer guru and internet technician (from Australia, I believe) is resurrecting the Da Vinci debates. Slavisa Pesci has taken the painting "The Last Supper" and has superimposed it on itself. The result: A couple of new characters appear in the picture, a knight and a woman holding an infant. Just as well, Mary Magdalene disappears from the painting. Of course, a number of people are suggesting that this proves Dan Brown's theories true but really, this only seems to make them more laughable. 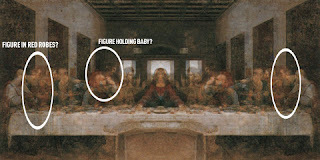 Anyways, even if the paintings were exact representations of the original, this still really proves nothing. All of us know that if we take a picture of someone, copy it and flip it over on itself, there will all of a sudden be another person in the picture--duh! Anyways, I have posted a copy of the superimposed picture below for your enjoyment--you may need 3D eye-glasses or perhaps crossed-eyes to make sense of it all. Oh yeah, and if you're interested in reading more, click the following link: Da Vinci Againci. Please, no cursing on this blog. I resepect the fact that you have found your way to this site and discussion board, but all foul language will be removed.